MasterChef Canada’s Top 3 are revealed | TV, eh? The Top 5! 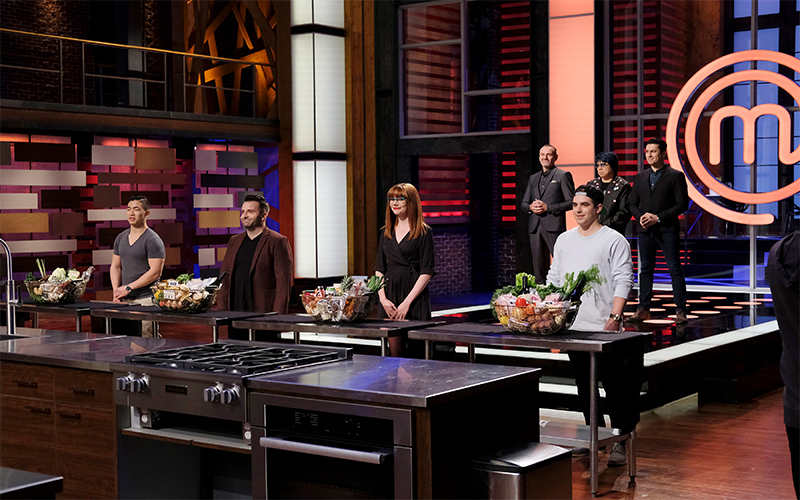 The MasterChef Canada title is closer than ever before. Tonight, the home cooks returned to where it all started. There were mystery boxes waiting for cooks. What was in them? The ingredient that helped them to get on the show and be the lucky chefs in the first place. But that wasn’t the only surprise! Families!! Contestants got to cook with their loved ones. I was really excited to see the teamwork and powerful unity of a family. The home cooks had one hour to master their ingredient in a new, more exciting way. Chefs Claudio, Alvin and Michael made their choice. The first to call was Andy and his wife Jessica. They prepared a scallop ceviche with a pistachio-coconut cracker; it was a light and fresh little dish. Beccy and her father, Chris, were the next pick made by the judges. Their chicken roulade with beets two ways and butternut squash purée not only looked spectacular, but the taste was outstanding as well. The final couple was Michael G. and his sister Sarah! The look of their pork and lamb ravioli with tomato basil sauce and grilled cauliflower was mouth-watering. However, it’s the judges who had to decide, not my hungry stomach. The winner was chosen: Beccy and her father Chris were the winners. What was next? The Elimination Challenge! The home cooks met past MasterChef Canada winners who had baskets full of incredible ingredients themed for baking, Asian, Italian and seafood. So many flavours! Beccy had the right to distribute the baskets among the other contestants. Chef Claudio, Alvin and Michael had to try all the dishes and decide who was going to be in Top 3! Nadia received the seafood basket and made fried crab and fried green tomatoes. The chefs were not amused. Michael G. and his Asian basket delivered Thai green curry with poached lobster and crispy geoduck. It was a good attempt by Michael to cook Asian. Eugene cooked pasta and meatballs … and the meatballs were hidden in the tomatoes! Andy received the baking basket. He was terrified but made a nice looking sweet and savoury tart with candied bacon and mascarpone cream. It was terrific! The last to call was Beccy, who made poached pears with pink peppercorn tofu and cranberry curd. It looked nice, but the taste was not there. Michael G. and Andy made it through to the Top 3! And with just one space left between three home cooks, the final spot went to … Beccy!